The Got Triplets t-shirt is a must have shirt for every father of triplets, and a natural gift idea for the new triplet dad. Got Triplets? Get the shirt! Triplet moms love this popular shirt. 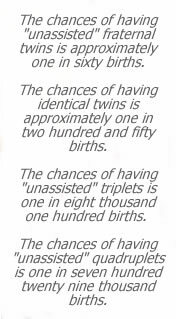 You can answer the "are they triplets?" question before strangers even ask - as if wrangling three toddlers or preschoolers all the same age wasn't answer enough. Our "got twins" on the tummy. A slightly plumper font is the focal point of this cute, maternity tailored, 100% cotton t-shirt from TummyWear. Our classic "Got Twins" (Chest Version) is printed on maternity tailored, 100% cotton t-shirts from TummyWear. A favorite of pregnant twin moms, the Got Twins maternity shirt is wonderfully comfortable, stylish, and also a great conversation starter!